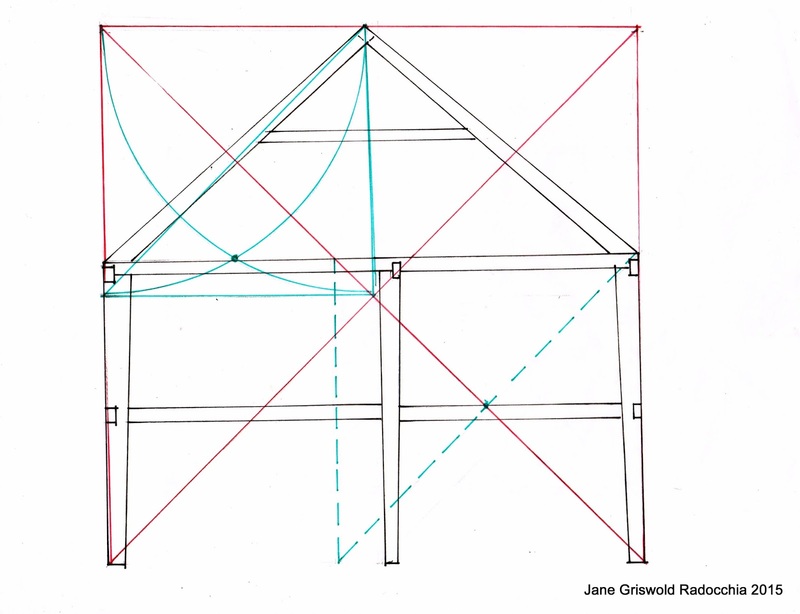 When does geometry enter into the design and construction of a building? 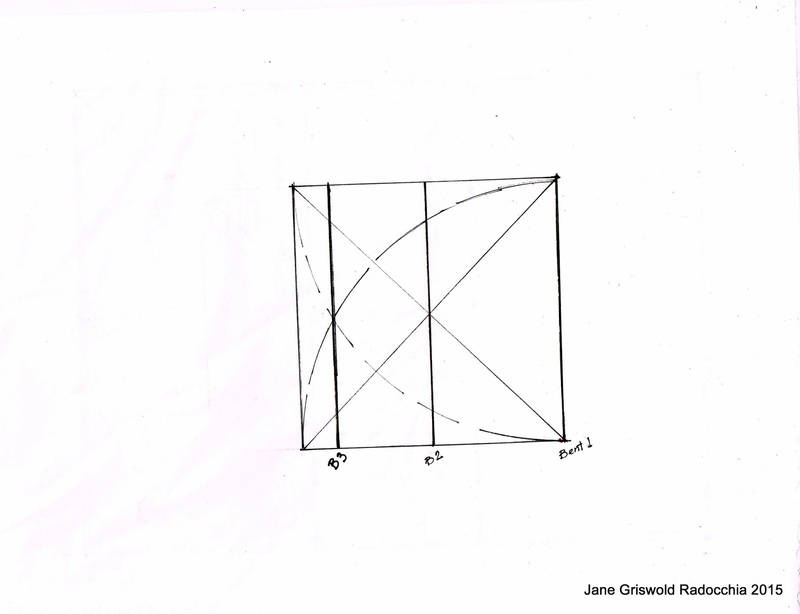 Only when the basics are answered can layout and design begin, can geometry be considered. The design of any building begins with need, ‘What?’ and ‘Why?’. Of course people often start with the vision, what they want the space to look like, materials they hope to feature. They may focus on a specific use for the space. Sometimes they just begin with ‘Bigger than this!’ The planning then must cycle around to answer the other questions. The Cobb-Hepburn House began with most of those questions already answered. About 1780 the Charles Miles family needed a house on their land in Tinmouth, Vermont. The house would look like houses they knew: a 2 story box with a gable roof and a center chimney, with a layout that was also familiar: a hall, a parlor on the front and a kitchen with service spaces behind. Here is their house after the modern siding was removed. The original house was probably not painted. It would have had small paned windows and a larger chimney. The house would be framed of wood of which they had plenty. The foundation and chimney of stone – which also ‘grew’ right there. The frame would be 4 bents long and 2 bays wide. 14 feet square +/- seemed good sizes for the Parlor and Hall. The space for the chimneys needed not be as large. Please read left to right. 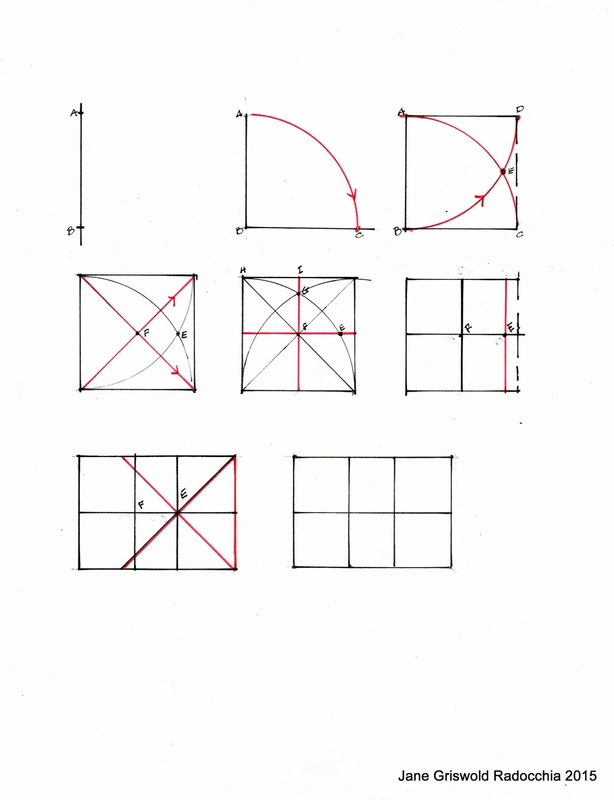 I have shown in the first 5 diagrams 2 points for each straight line. After that I have assumed the geometry is reasonably clear. I have also added a description even though I often find it easier just to read the drawings. 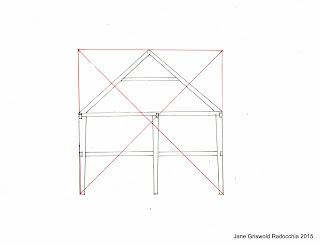 1 -- The width of the house was laid out: 28’-6”: the length of the first bent. E marks the intersection of the arcs. 4 -- Diagonals were added: F is the center. 5 -- The square divided in half both ways: the second bent. 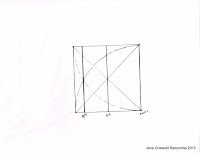 6 -- At E a vertical line was drawn: the third bent. 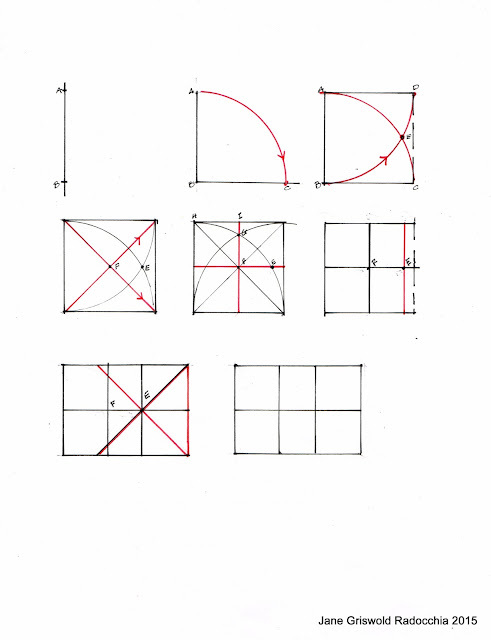 7 -- E is the center of the second square. 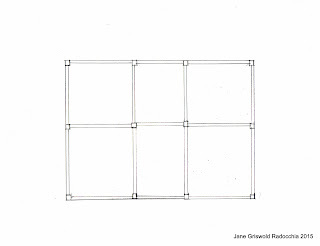 The length of the sides of the square could have been stepped off to match the first square or laid out with geometry. The fourth bent is the right side of the 2nd square. 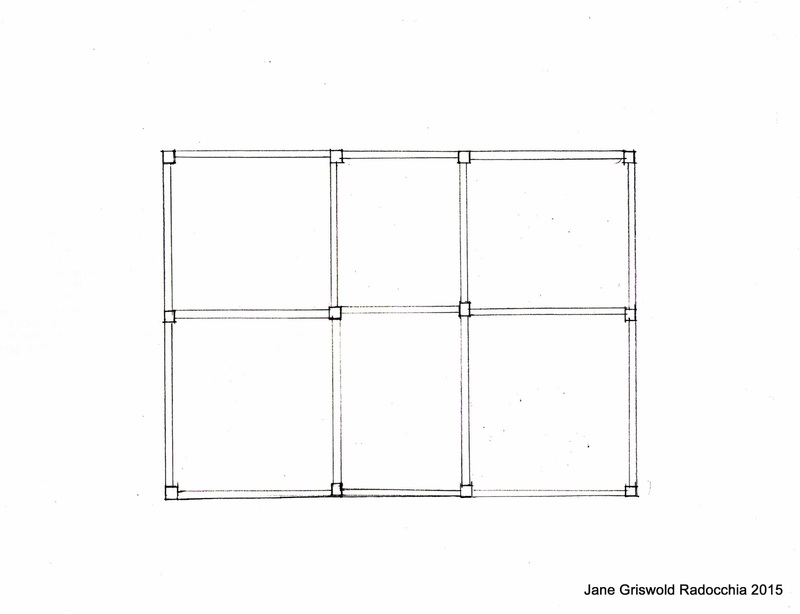 8 -- is the plan for the house, showing the locations of the posts - almost. 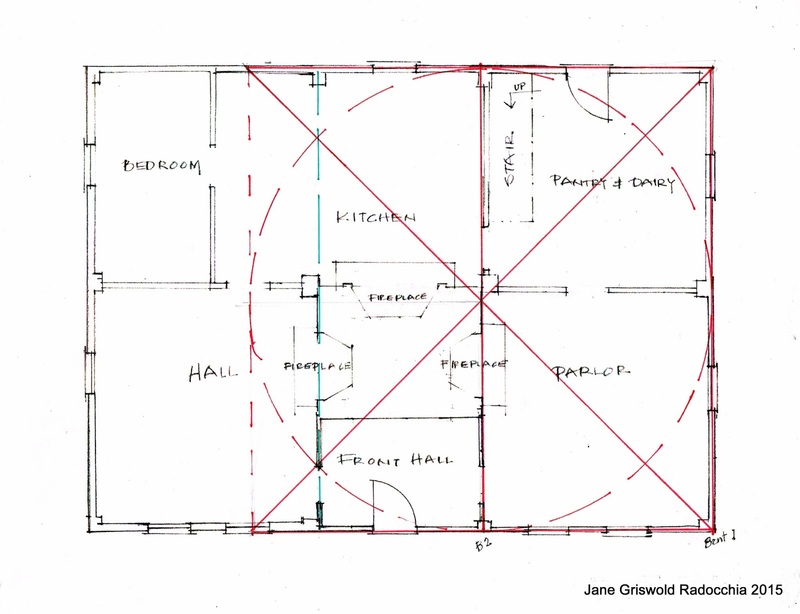 The as-built plan for the Cobb-Hepburn House, shown here, is not quite symmetrical. 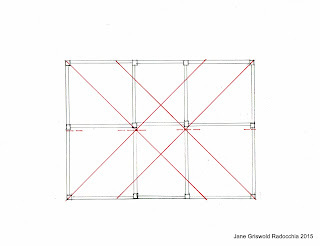 Here is the plan showing the posts and beams for the 2nd floor with the 2 crossed squares in red. 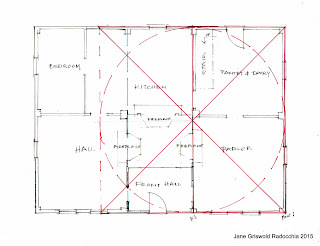 I have seen the use of 'Crossed Squares' in many New England floor plans.Before I explored the geometry of this house I had not seen layouts use the intersections of the arcs as determining dimensions. The framer used his intersections as the outside of the post location for the center bents. He seemed to set the center posts and beams back about 8" so that the chimney could more easily exit at the ridge of the roof. Here is an elevation of the bents from front to back for the house. It fits within a square. If the square is divided into its 4 smaller squares and the arcs of the length of the smaller square are drawn the intersection is the location of the top of the plate - see the green square on the upper left side and intersection. 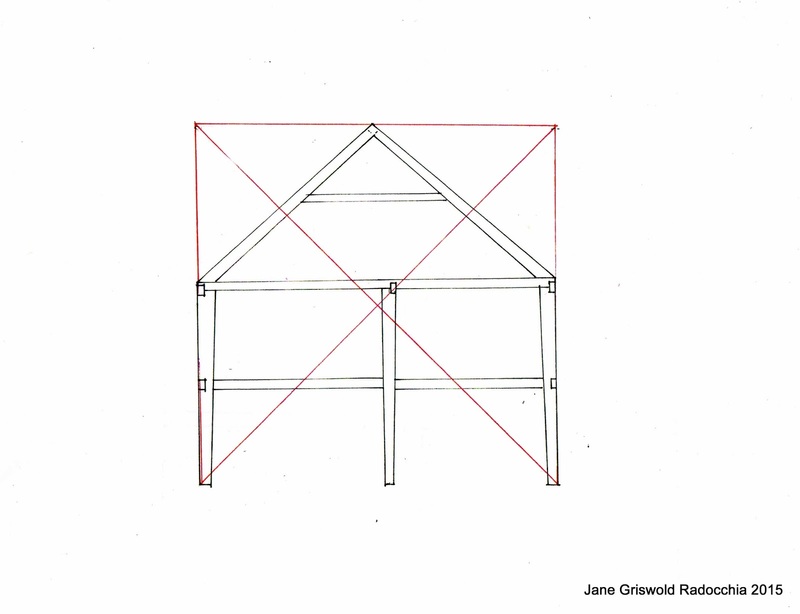 Once the height of the house frame was set, the rafters could be laid out. The second floor location was determined very simply: the top of the beam was located at mid point of the distance from the first floor to the plate - shown with a dotted green square on the lower right side. 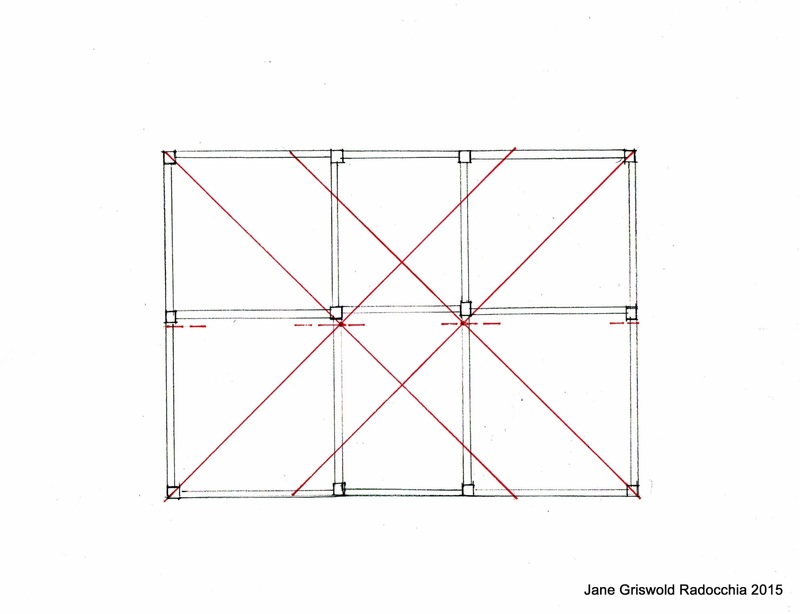 In both cases the framer used his intersections as the outside, not center line, of his beams. 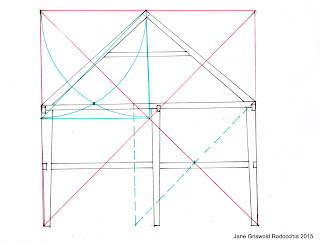 The elevations of the house used the same geometry. That's next.